Concern for those who need homes, advice, understanding and encouragement are an integral part of this beautiful life. Participating in the Dial-a-Listener program and serving on the Board of Directors of the Lend-a-Hand Club, the "home away from home" for young ladies and a meeting place for many community organizations. (Mrs. Eula Wolf and Mrs. Grace Stiles, Board Members). Combining her professional skill with her interest in young people, she has for many years done the hair of young girls from the Iowa Annie Wittenmeyer Home of which Mr. James Holmes is the Director. (Letter from Mr. Holmes). Many high school and college students have sought her wise counsel fro time to time and have found understanding and generosity. (Miss Doris Entler, "Miss Scott County"). Good citizenship is something highly prized by Cecile Cooper. She has been and is active in the Davenport Community; many public officials are her personal friends (Mayer Jebens' letters; her friend and ours Kathy Kirschbaum, Alderman-at-Large; 4th Ward Alderman Larry Herington, illness of his wife prevented his being here.) She has served for years at election time as a poll watcher and as a worker for the Scott County Democratic Organization. (Dr. Alana Hathaway, City Chairman and past Chairman of the County). Her interest in good government and a well informed electorate is evident in her serving as a Member of the Board and Human Resources Chairman of the League of Women Voters. (Mrs. Jane Dubens, Past-President). To introduce her inter-faith and international activities Mrs. William Frison, wife of the Pastor of the Mt. Olive Church of God in Christ will favor us with a solo. Cooperation with active members of all faiths is another of the marks of this beautiful life as it reaches out to others. 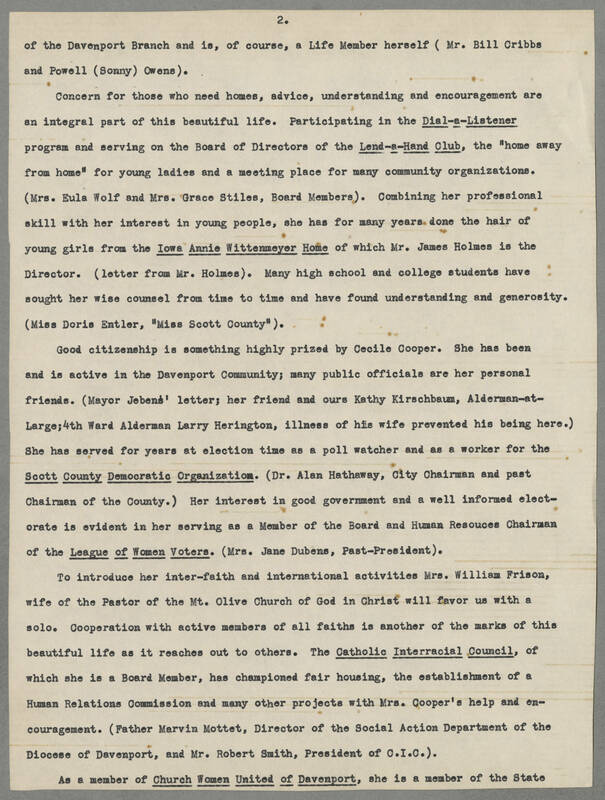 The Catholic Interracial Council, of which she is a Board Member, has championed fair housing, the establishment of a Human Relations Commission and many other projects with Mrs. Cooper's help and encouragement. (Father Marvin Mottet, Director of the Social Action Department of the Diocese of Davenport, and Mr. Robert Smith, President of C.I.CI. ).